The Del Taco secret menu is just as diverse as the secret menus offered by the likes of Taco Bell Secret Menu. Make no mistake about it though, this is not a clone of Taco Bell. Not by a long shot. 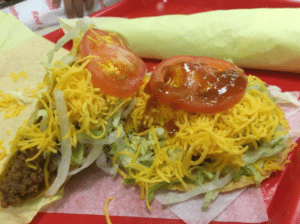 As a result, Del Taco the secret menu, as well as the standard menu, is completely different. Del Taco is open 24 hours a day and 7 days a week. This means that it attracts a certain clientele that other restaurants just don’t get. To put it simply, there are a number of blurry-eyed, hungry souls passing through these doors every night. And all of them are eager to get their fill of Mexican food. 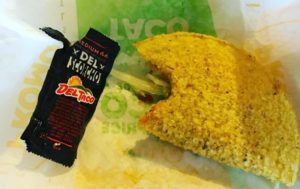 The following Del Taco secret menu items relate both to the “Del Taco Stoner’s Secret Menu” and to the “traditional” secret menu, for want of a better word. So, whether you’re on the munchies and are seeking something to make the night complete; you’re drunk/hungover and have a void to fill; or you’re just looking to grab a bite at lunch, the following can help. 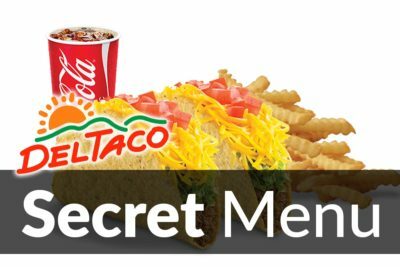 What is on the Del Taco Secret Menu? It may not look like the most appetizing burrito, but this tightly-packed, saucy, carb-loaded snack is perfect to get your energy levels up when you’re a little worse for wear. The aptly-named “Stoner Burrito” was created by a certain subculture looking to sate their insatiable appetites after a toke too many. 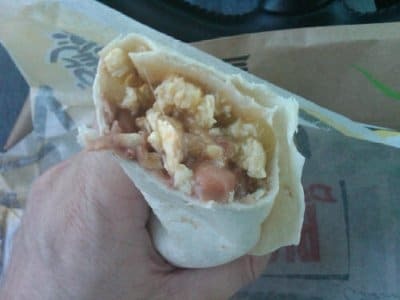 Of course, it’s probably best that you don’t ask for a “Stoner Burrito”. Unless the servers are a certain way inclined, they might not know what you’re talking about. Instead, just ask for a bean and cheese burrito that is filled with fries, special sauce, and your choice or red sauce or green sauce. If you like a little heat, then ask them to throw some extra chilies in there. If you want things a little cooler, then opt for a topping of sour cream instead. The Stoner Burrito is not just for stoners either. The Stoner Burrito is a meal in a burrito, making it great for when you’re on the go. Much like a breakfast burrito really, only for every other time of the day. Special sauce and fries can make anything better. Your burrito? 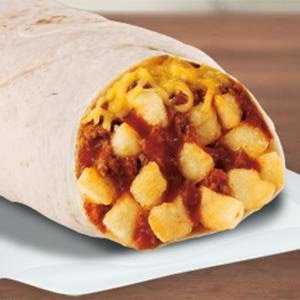 Add a dollop of sauce, some crispy fries and it’s the ultimate Stoner Burrito. Your cheeseburger? That meat and that cheese is just crying out for some fries and some sauce. Your crippling emotional pain? Sure, why not. It’s worth a shot. In Del Taco, the two words that can make this magic happen are “Go Bold”. These are the magic words that will get some extra special sauce and fries in anything you order. The picture is of a “Go Bold” Quesadilla, which is a delicious hot mess. 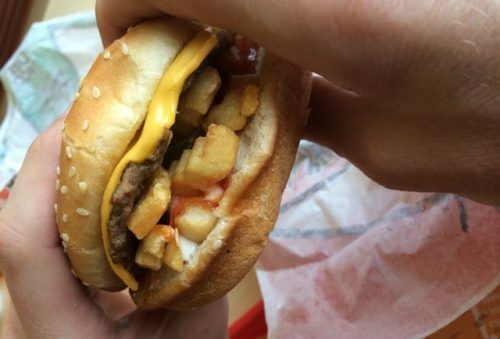 But you can also do this with Del Taco burgers, burritos and anything else on the menu. We wouldn’t recommend that you “Go Bold” on your drink or dessert. But if you are feeling that way inclined, then please take a picture of that abomination and send it our way. That’s something we just have to see. Some people just aren’t cut out for Mexican food. They are the ones who slop everywhere. The ones who can’t seem to eat a taco without looking like they’re been dragged through a messy kitchen. If this sounds like you, then maybe you would be better off with the Bun Taco. Simply put, this is a taco in a bun. It has everything you would expect to find in a taco, but instead of oozing out of the side of a crisp shell, it’s tucked into a neat bun. So, whether you want to limit the mess, or you simply prefer burger buns to taco shells, this is the Del Taco secret menu item for you. This is a protein feast in a convenient cup. In essence, the Del Taco Combo Cup is everything you would usually find in a burrito, but in a cup. Why leave out the tortilla? I hear you ask. After all, isn’t that the best part? Well yes, but not if you have a food sensitivity or if you’re trying to cut back on your carbs. The Combo Cup is Atkins friendly, which is a rarity for a menu item in a Mexican fast food restaurant. 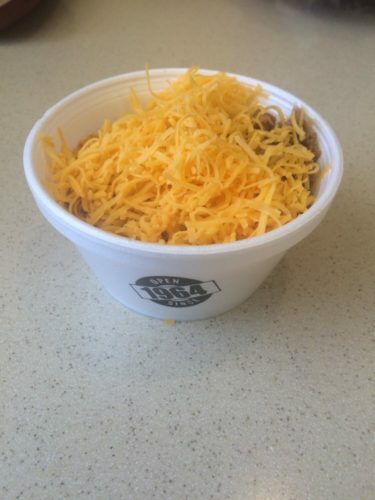 It’s also loaded with protein, which comes courtesy of the cheese, the meat and the beans. Except for the inclusion of quite a bit of fat, this would otherwise be a healthy meal. To order this, you just need to order a Combo Burrito, asking for the ingredients to be placed into a cup as opposed to a tortilla. You can also get the tortilla or some chips on the side, perfect for dipping and scooping. This is another item that will get you nothing but a raised eyebrow if you ask for it at the counter. The Green Bean Machine is just a name that a blogger came up with to describe this secret menu item. 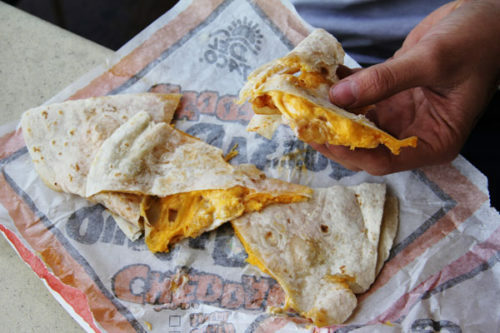 It’s also one that has been adopted by many Del Taco secret menu fans over the years. A Green Bean Machine is basically a burrito that is loaded with scrambled egg and beans. This may not sound like the most appetizing burrito on the menu, but don’t let that description (or that picture, which looks like something that has already been eaten) fool you. This makes for a great alternative to some of the traditional breakfast burritos on the menu. To order your own Green Bean Machine, just request an Egg & Cheese Burrito and add some beans and sauce. The “green” part comes from the sauce, which is green instead of red. 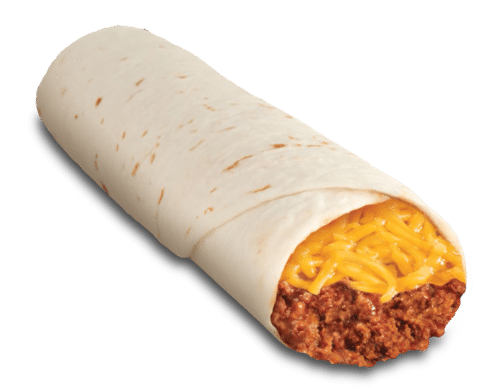 This is a simple cheese burrito, with oodles of the gooey, stringy, fatty stuff that we all love. Let’s be honest, the cheese is one of the best things about Mexican food. You can take your beans, your tortillas and your sauce. You can take your meat and your spice. But leave the cheese, because that’s what makes this food so comforting, so hearty and so deliciously bad for you. To get your hands on this simple burrito, just order a burrito with lashings of cheese, a hearty dollop of sour cream and some red sauce. That’s all there is to it. The sauces are what makes a fast food restaurant. Think about it. KFC wouldn’t be KFC without their “Secret Recipe”. McDonalds burgers wouldn’t taste the same without that tangy sauce. And Popeyes would be decidedly less interesting without their secret Cajun Sparkle seasoning. And the same applies to Del Taco. In this case, it’s the Del Inferno sauce that makes this brand so popular. 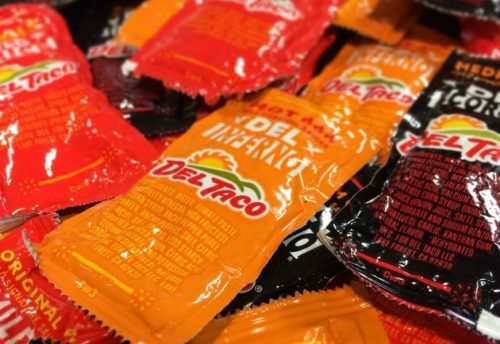 This sauce can be found in abundance in any Del Taco restaurant, but what if you want it at home? You could try to concoct a similar creation yourself, or you could buy it. Thankfully, Del Taco sells their Del Inferno sauce in bulk. And it’s cheap! On the Del Taco homepage you can order 100 sachets of their Del Inferno sauce for just $5.99. These sachets come in a storage bucket. If you’d prefer, you can purchase their mild sauces or their super-hot sauces. There are also combination packs available. The Del Taco site sells plenty of other Del Taco merchandise as well. If you’re obsessed with this brand, as so many Americans are, then this is where you can declare your allegiance to the Taco.